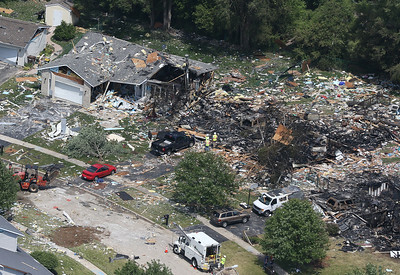 H. Rick Bamman - hbamman@shawmedia.com Investigators on the scene of a Marengo home explosion that destroyed or damaged neighboring homes, left eight to 10 more houses uninhabitable and sent two people to the hospital around 5 a.m. Sunday. Marengo Fire Chief Bob Bradbury said at least 30 additional homes in the neighborhood were affected by debris. A damage estimate isn't yet available. "We haven''t grasped that," Bradbury said. "We have a crew of building inspectors going around right now looking at the damages." 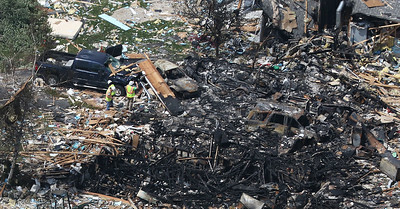 H. Rick Bamman - hbamman@shawmedia.com Investigators work through the debris and damaged vehicles Sunday afternoon after a Marengo home explosion destroyed a neighboring home, left eight to 10 more houses uninhabitable and sent two people to the hospital around 5 a.m. Sunday. Marengo Fire Chief Bob Bradbury said at least 30 additional homes in the neighborhood were affected by debris. A damage estimate isn't yet available. "We haven''t grasped that," Bradbury said. "We have a crew of building inspectors going around right now looking at the damages." H. Rick Bamman - hbamman@shawmedia.com An areial view looking north along north east along 7th Circle towards Foxglove Ln. 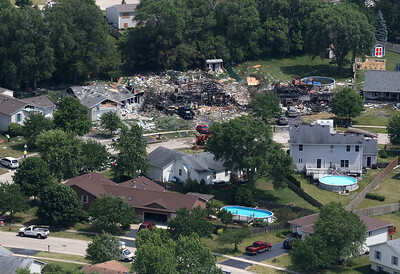 (behind the tree line) in the neighborhood where a home explosion destroyed a neighboring home, left eight to 10 more houses uninhabitable and sent two people to the hospital around 5 a.m. Sunday, June 11, 2017 in Marengo. H. Rick Bamman - hbamman@shawmedia.com An areial view looking south east from along 8th Ave. towards 7th Circle in the neighborhood where a Marengo home explosion destroyed a neighboring home, left eight to 10 more houses uninhabitable and sent two people to the hospital around 5 a.m. Sunday, June 11, 2017. H. Rick Bamman - hbamman@shawmedia.com A Marengo home explosion (center) destroyed a neighboring home, (right) and severly damaged a third (far left) and left eight to 10 more houses uninhabitable and sent two people to the hospital around 5 a.m. Sunday. Marengo Fire Chief Bob Bradbury said at least 40 additional homes in the neighborhood were affected by debris. A damage estimate isn't yet available. 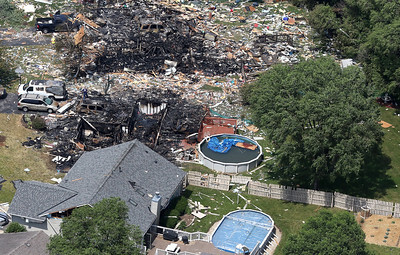 The owners of the home where the explosion initiated weren't home at the time of the incident, but there were animals inside. H. Rick Bamman - hbamman@shawmedia.com An areial view looking east along 7th Circle towards Foxglove Ln. 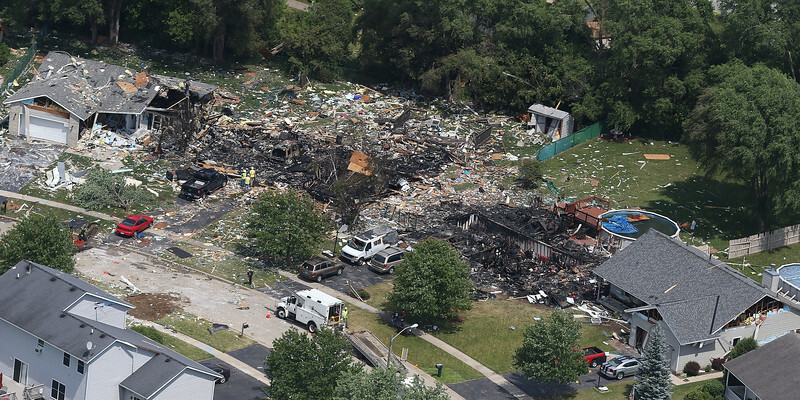 shows some of the damage to neighboring homes caused by an explosion around 5 a.m. Sunday, June 11, 2017. Marengo Fire Chief Bob Bradbury said at least 40 additional homes in the neighborhood were affected by debris. H. Rick Bamman - hbamman@shawmedia.com A Marengo home explosion destroyed a neighboring home, left eight to 10 more houses uninhabitable and sent two people to the hospital around 5 a.m. Sunday. Marengo Fire Chief Bob Bradbury said at least 30 additional homes in the neighborhood were affected by debris. A damage estimate isn't yet available. "We haven''t grasped that," Bradbury said. "We have a crew of building inspectors going around right now looking at the damages." 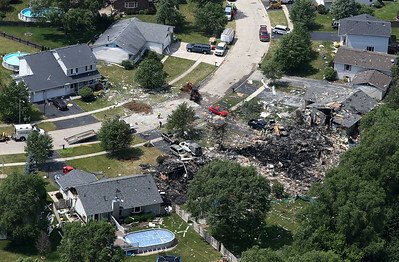 The owners of the home where the explosion initiated weren't home at the time of the incident, but there were animals inside, Bradbury said. 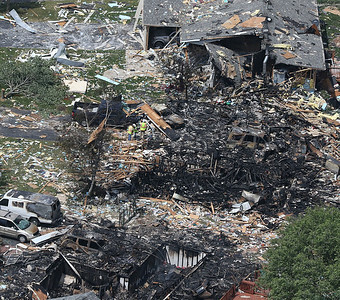 The cause of the explosion is under investigation. Foul play isn't suspected at this time, he added. Two people were transported to Centegra-Woodstock Hospital with minor injuries. H. Rick Bamman - hbamman@shawmedia.com An areial view looking north along 7th Circle towards 8th Ave. in the neighborhood where a Marengo home explosion destroyed a neighboring home, left eight to 10 more houses uninhabitable and sent two people to the hospital around 5 a.m. Sunday, June 11, 2017. Marengo Fire Chief Bob Bradbury said at least 40 additional homes in the neighborhood were affected by debris. 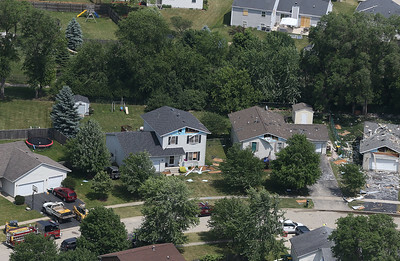 A Marengo home explosion (center) destroyed a neighboring home, (right) and severly damaged a third (far left) and left eight to 10 more houses uninhabitable and sent two people to the hospital around 5 a.m. Sunday. Marengo Fire Chief Bob Bradbury said at least 40 additional homes in the neighborhood were affected by debris. A damage estimate isn't yet available. The owners of the home where the explosion initiated weren't home at the time of the incident, but there were animals inside.